Bookeasy, in partnership with beDigital, have some fantastic news! On the evening of Wednesday 27th May 2015, an enhancement and upgrade to the way specials are showcased on the beGadgets will be launched. This upgrade will provide website visitors with greater transparency of special deals created by accommodation operators when searching for accommodation and viewing the various product items showcased on operator profile pages. This change will impact the styling of the existing icons displayed on your current beGadget implementation as soon as the enhancement is released. As a result, any current specials icons displayed on your website (whether they're our default icons or custom icons of your own) will be replaced by our new default icons. If you have customised the styling of the existing last minute and hot deal icons, then you may need to review the changes prior to release in order to prepare new custom icons (in the event you don't wish to use the default beGadget icons). In addition, new features will allow you to further customise the way specials are promoted to end users, as per the below information. The upgrade will occur in the evening of Wednesday, May 27th 2015 (approximately 9pm Australian EST). Prior to this change, the only way that specials and last minute discounts were showcased on the beGadgets were via graphic icons. These icons would flag a product as a "Hot Deal" or "Last Minute", however would only display in the event the end user was searching the exact number of nights applicable to the specials created. Further limitations included the fact that consumers had no information provided explaining a special's details, as a special's name and description was not displayed via the beGadgets. We've updated the default beGadget icons presented to consumers when viewing specials. These icons have been simplified for desktop and mobile devices whilst providing a clear indication to the viewer as to what each icon represents. A generic promotion will display when the end user hovers over the icon for each operator, stating "Specials Available" or "Last Minute Rates Available". This is generic as the Region beGadget displays the best available rate (and the operator may have multiple products each with their own unique specials applied). The rates displayed in the Region Gadget's price view are hyperlinked, whereby when the end user hovers over the rate they are provided with the special's name and description. This can be styled when implemented at your discretion. The "details view" tab will display a special and/or last minute icon, with click action to the items beGadget. The "map view" tab will display a special and/or last minute icon on both the list of operators and map icon popups, with click action to the items beGadget. Specials info will display when the end user hovers over the icon or monetary rate for each product listed. Please note the rate styling can be customised at your discretion, via custom CSS rules in your own template. When the descriptionHover and showHoverInline parameters have been enabled on the Items beGadget, the special's name and description will be presented when the end user clicks or presses on the 'more' button. This will expand further information with the special's info at the top. The descriptionHover and showHoverInline parameters are a great way to provide this information to users viewing your website on mobile devices (as mouse hovers don't function well on some mobile devices). Text will also be displayed under the icons providing a brief description of the "special type". If a consumer is viewing an operator page's items beGadget within a date range whereby a special has been created by the operator, but has not selected the specific number of nights required for that special to become active, the consumer will be provided with a grayscale icon indicating that a special is available. In this scenario, the end user will still be provided all relevant information regarding the special. The end user will also be able to click on the icon which will automatically adjust the number of nights selected in the gadget to the number of nights required in order for the special to be applicable. If you have a development / stage / UAT / testing server, update that server to run the beGadgets in development mode, so that you can preview the latest version of the beGadgets as per the following steps. To run the beGadgets in development mode, please adjust the hostname of the URL of the <script> include, from gadgets.impartmedia.com to gadgets-pvt.impartmedia.com. If you do not have any development / stage / UAT / testing server for your website (only a live production website), you will need to wait until after the beGadget upgrade has occurred, then review the changes directly on the live website, (refer to step 3 onwards). 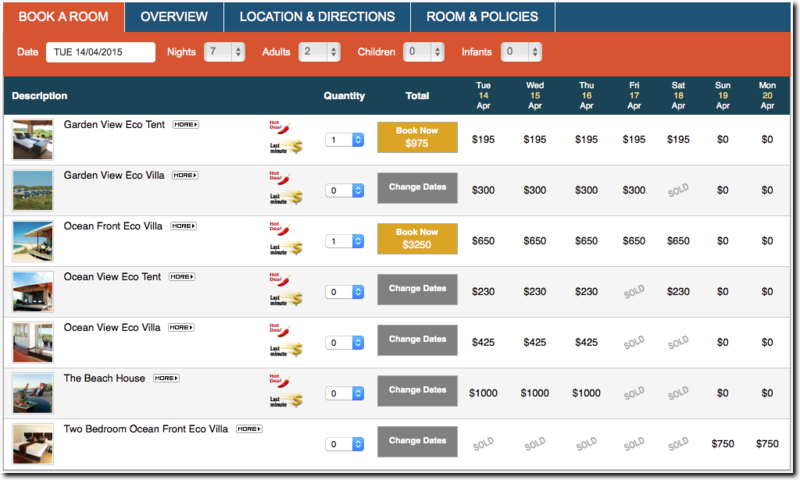 Ensure dollar discount, percentage discount, pay stay deals and last minute discount specials have been created and made available in at least one Bookeasy accommodation operator console, so that you can test effectively. Tourism Centre Staff will be able to login using their standard username and password, whereby they can create specials for their accommodation operators (and it won't affect their live data). It should also be worth noting that Bookeasy's PVT environment is refreshed on a nightly basis and synced with the data in the live production environment, so if you need to test over the course of a few days then the tourism centre staff will either have to recreate the specials in PVT on a daily basis, or create a test operator in the live production environment for their specials (whereby this data will be synced with PVT overnight and be made available each day). Check that the Region beGadget is displaying specials icons correctly. If you wish, customise the styling of specials icons on the Region beGadget, via your own CSS rules. If you wish, customise the styling of prices on the Region beGadget (which were previously text but are now linked), via your own CSS rules. Check that the Items beGadget is displaying specials icons correctly. If you wish, customise the styling of the specials icons on the Items beGadget, via your own CSS rules. If you wish, customise the styling of the prices listed on the Items beGadget (which were previously text but are now linked), via your own CSS rules. If your website has a responsive template or a dedicated "mobile site", please double check all gadgets are displaying correctly on small screen devices when specials are enabled and visible. Where Can I Go for Help and Support? Please direct all queries to bedigital@bookeasy.com.